This Inertia Measurement Unit Combo Board incorporates the IDG500 dual-axis gyroscope and Analog Devices triple axis ADXL335 accelerometer in a tight footprint. The IMU board uses a standard 0.1" footprint and includes all outputs from both the IDG500 gyro and ADXL335 accelerometer ICs. This IMU 5DOF is the latest in a long line of development boards. This latest version allows an unheard of 5 axis of sensing (Roll, Pitch, X, Y, Z) in less than 1 square inch, and under 2 grams! 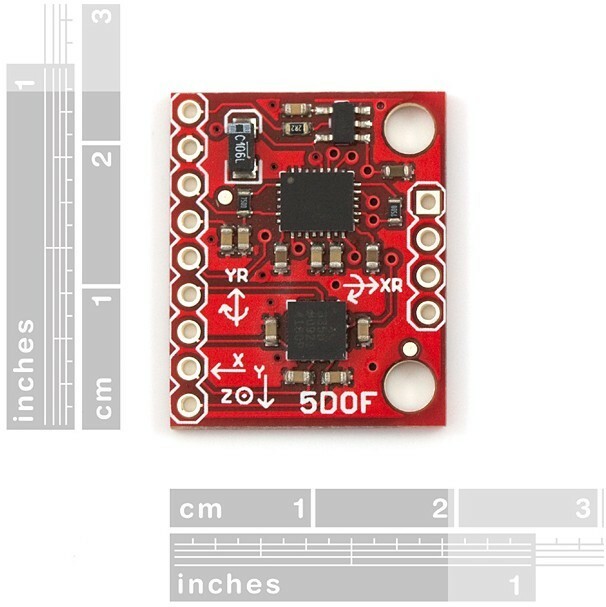 By combining the IDG500 and ADXL335 sensors, the IMU board enables students and hobbyists to easily incorporate roll, pitch, and tilt measurements into their projects or robots. Board comes fully assembled and tested. Units come as shown without headers installed. We recommend right-angle break away headers, straight pin headers, or wire up your own cable! Get Sharp GP2D12 IR Ranger Sensor from DFRobot Store or DFRobot Distributor.